This page documents the writing weeks about the German-speaking Community in December 2018. 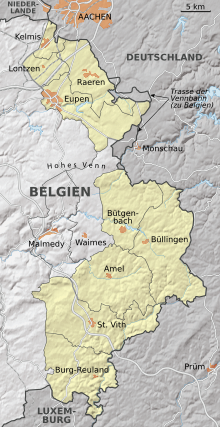 Because the German-speaking Community of Belgium is in several Wikipedias only limited described, we organise these writing weeks to fill this part of the Belgiumgap. During the project of the Monuments German-speaking Community when we checked for monuments having an article in Wikipedia and noticed not only many monuments have no article, also many other subjects are missing. In line with earlier writing weeks, including the Brussels writing weeks in 2016 and 2017, we organise new writing weeks about this area.